We can write, record, and master your audio project to save you time & money! Multitrack & multivoice digital audio production is available. Female voice talent is also available through Walt for multi-voice jobs. Over 20 years of voice talent and production experience. 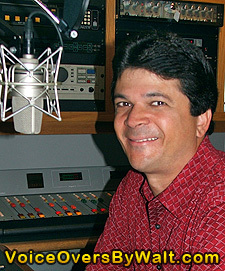 Walt's voice has been heard nationally for clients such as Colonial Bank, Proflowers.com, Comcast, Isuzu, Toyota, Nissan, Chrysler and Honda, The Tampa Bay Performing Arts Center, AMC Movie Theaters, Gurkha and Camacho Cigars, The Tampa Bay Lightning NHL hockey team, the WWF (now WWE), The Tampa Bay Storm Arena Football, and many more. Over the years, he's done countless Message-On-Hold Phone IVR, Industrial Training Video voiceovers, Real Estate Voiceovers, Website Narration voice overs and every imaginable type of radio commercial, plus various TV Voiceovers, and "audio business cards".